I don’t know anyone who doesn’t like cookies. They really are the perfect treat. I also think they make great gifts as well – for baby showers, new neighbors, housewarmings, etc. I’ve used quite a few services over the years that have delivered goodies to friends and family, but I’m happy to have been introduced to a local shop that delivers fantastic tasting cookies wrapped up in pretty packages – Sweet Andy’s Cookies. 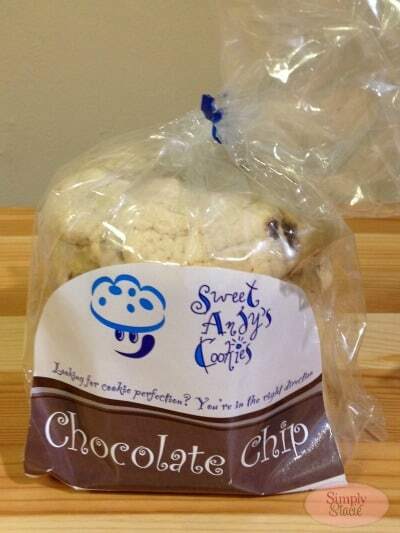 Based in Long Island, NY, Sweet Andy’s Cookies started when Andy, who had worked in the financial services field, found himself out of a job back in 2009. He and his wife struggled and did their best to help support themselves and their five children. They relied on the generosity of their friends who helped them through their tough times. Andy wanted to thank his friends for all they had done for his family, so he created a recipe for the perfect chocolate chip cookie. His friends went crazy for the cookies to the point where one friend who also happened to own a deli asked Andy to make some to sell in his shop – they quickly sold out and Andy was asked to make more – and that’s how Sweet Andy’s Cookies was born! I received six wonderful varieties from Sweet Andy’s Cookies for review. The cookies arrived in a box perfect for gift giving – and inside the box each flavor of cookie was individually wrapped (perfect for gift-giving separately too!). The flavors I received were: Peanut Butter Chip, Triple Chip, Sugar Cookie, Oatmeal Raisin, Lemon Cookie, and the classic Chocolate Chip. I tore into the Chocolate Chip bag first – always my favorite flavor! I loved not only the taste of this cookie, but also the soft texture. It was chock full of chocolate chunks, a real chocolate treat. My husband and I tasted each cookie and found that we loved them all. The flavors of each were so fresh and tasty. These would make great gifts to send and share with friends and family. 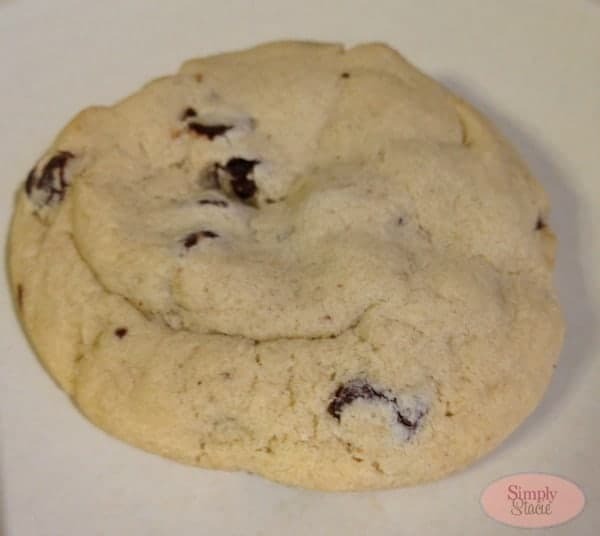 Sweet Andy’s bakes each order fresh, and the cookies have a shelf life of two weeks – but the best part is, they freeze well, so you can keep them even longer! I’ve popped a few in my freezer to enjoy later. 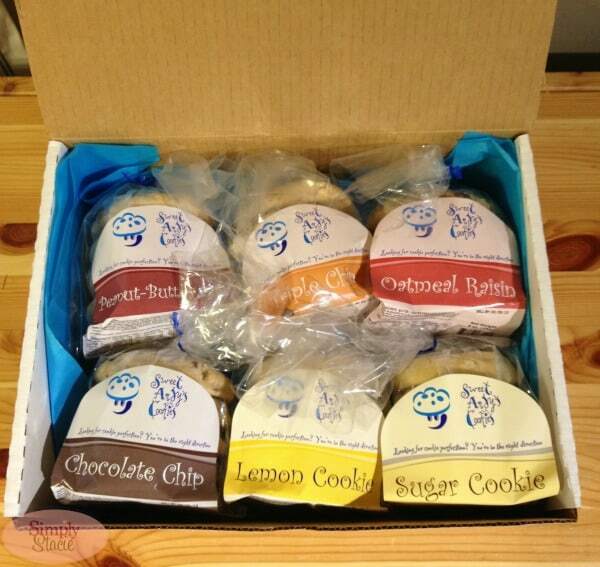 You can order Sweet Andy’s Cookies online and pick out four or six varieties of cookies to be delivered. The six variety box I received sells for $35.95. Cinnamon Sugar is my favorite. They sound delicious. I would say chocolate chip or sugar! Triple Chip cookies soundtoo good!! I do love my cookies!! I would like to try the Oatmeal Raisin. I would love to try the Mint Chip, thanks! Just regular ol’ chocolate chip is my favorite! Yummy! I think my favorite flavor would be the classic Chocolate flavor. I love the White Chocolate Macadamia flavor!